This type of problem occurs when one of the main components responsible for the garage door's operation is damaged, malfunctioning or disengaged from the system. If the door does not move when the button on the remote control is pressed, the problem may be with this accessory or with the garage door opener. If the opener cannot be started with the use of the button mounted on the wall, then the issue most probably lies with it. Otherwise, the problem is with the remote. If the opener works normally, but the garage door won't open, then the problem must be with the hardware. 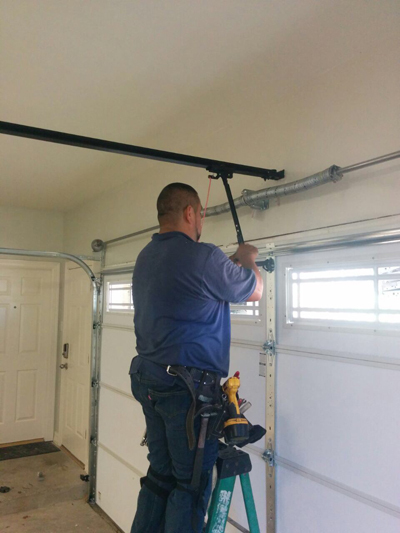 Typically, the garage door cannot move due to a broken torsion spring or extension spring. In such cases, the broken part requires timely replacement. The other common hardware cause of this issue is snapped garage door cable. In this case, the old part must be replaced with a new one.